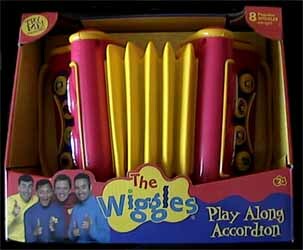 The Wiggles: Play Along Accordion is another quality Wiggles toy. Look and play like Jeff as you listen to one of eight Wiggles songs. And, while the song is playing, press the buttons to hear a short sample of an accordion in action. While this is not really a musical instrument - in the sense that you can't actually play any notes yourself - it allows your little ones to pretend to be one of the Wiggles. Although, I have to be honest here and say that I really think that the batteries should be removed before giving this as a present. While the songs are fun, and the accordion noises impressive, it is quite loud and won't take long to get on most adult's nerves. 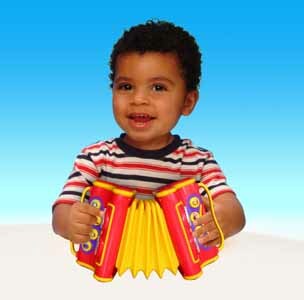 While obviously not as cool at some of the other Wiggles toys (I'm thinking of the drum kit, guitar and keyboard) this toy is made from good quality materials, and will provide tiny tots with hours of fun.